Michael Ioannou collects his winnings. A San Jose lawyer was the lucky winner of $750,000 in a Mega Millions draw last month, and he found out only after watching the local news. Michael Ioannou was watching a TV newscast a couple of days after the May 20 drawing. The report said the winning ticket, which matched 5 of 6 numbers drawn, was sold at Coach House Wine & Liquors in Cupertino, where Ioannou usually buys his tickets. That prompted him to check - and recheck - his ticket. He said he looked at it "about 80 times" and "kept laughing." The 60-year-old is an attorney at the San Jose offices of Ropers Majeski Kohn Bentley, according to the State Bar of California. He's been with the firm since 1980 and is listed on the website as chairman. He is a graduate of Santa Clara University School of Law. 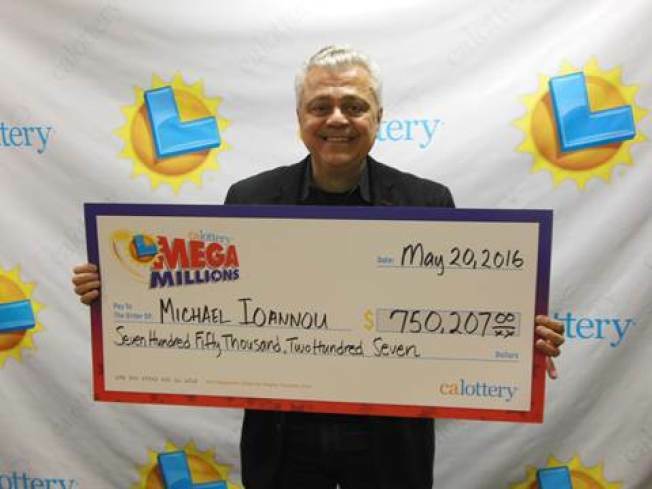 Ioannou told California Lottery officials he will put away the money for an earlier retirement. Ioannou’s winning ticket matched the numbers 26, 24, 19, 68 and 40, missing only the Mega number 8.